Do you wonder if it’s OK to kiss a cat when you pick her up for a cuddling session? Or maybe you want to know if Kitty knows that your kisses are a sign of affection. Then I’ve got you covered. I would say that there is nothing wrong to show your cat how much you love her by giving Kitty a peck on the head. However, you should keep in mind that some risks do exist, especially if you kiss your pet on the lips. It mostly depends on the health status of your pets. So, let’s see what’s the worst that can happen if you kiss a cat. What are the risks of kissing a pet? The good news is that cats and humans are two different species. In medical terms, this means that you can’t catch diseases that are specific to the cat family. So, you don’t have to worry about cat flu or cat HIV. If I have to be honest, it’s doubtful that you’ll contact something from your cat as long as you keep excellent hygiene and have a strong immune system. To minimizes your chances of contracting a disease you mustn’t forget to deworm Kitty regularly and make sure that she is up to date on her vaccinations. Who should avoid kissing cats? I’ve been scratched a hundred times without any infections or complications. Yet, I’ve read stories about people who got very sick from a simple cat scratch. Pregnant women due to the chances of contracting toxoplasmosis. Don’t get me wrong. It’s an excellent idea to raise children along with pets because it strengthens their immune systems. Researchers also have proven that the more you expose your child to pet, the less likely is the child to have allergies later in life. However, very young children have a weak immune system, which won’t be able to fight off some bacteria your cat might carry. Toxoplasmosis is also not life-threatening for adults, but it’s dangerous for unborn babies. It might result in a miscarriage or a baby born with serious complications like vision problems, and delayed development. So, avoid the cat’s litter box as much as possible. Should you kiss your cat on the lips? I love my cat with my whole heart, but I wouldn’t ever kiss her on the lips. I often kiss her on the top of the head and bump noses with her, but lip kissing is too much for me. It’s not that I find it gross, but the germaphobe inside me says that it’s unhygienic. I know that a lot of cat owners won’t agree with me, and I won’t argue. But I want to mention something. A cat’s mouth is not cleaner than a human one. Cats are predators and even when they live inside full-time, they catch various bugs and insects that have crawled inside your houses. So, Kitty’s mouth is full of bacteria that might be harmful to you in the long run. Not to mention that the cat licks itself everywhere (you know what I mean), and a lot of parasites are spread through feces. Do cats understand that kisses are signs of affection? 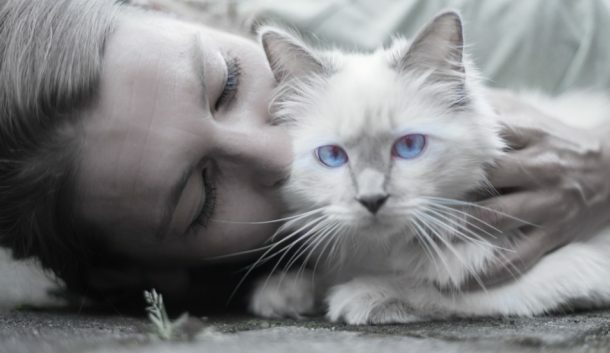 Cats demonstrate affection towards people they love in many ways. They rub against our legs, give us head bumps, or playfully bite us during playtime. Sometimes they even groom up by licking your hands or hairs. Grooming is a big sign of trust because felines groom each other only when they feel deeply connected. And kisses are not so different from a cat licking another cat. A cat kiss is when a cat looks at you and slowly blinks. That’s their equivalent of our “I love you” kisses. Blink slowly back at Kitty, and she will know that you care about her. The bottom line is that kissing a cat won’t get you sick unless you have a compromised immune system. 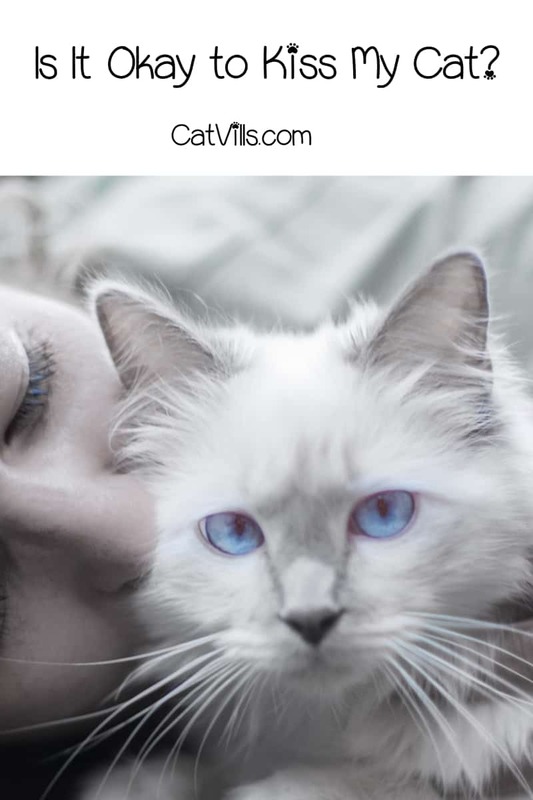 So, as long as you and your cat have a clean bill of health, feel free to enjoy kissing Kitty and showering her with affection as much as you want. What do you think about the subject? Is it OK to kiss a cat? Do you kiss your pet or you show your affection differently? Tell us in the comments. Wow this is great information! I don’t have a cat, but my daughter loves them (me not so much). I think maybe when she is older I would welcome the idea of adopting/getting a cat. This is great info to keep in mind, thanks for sharing!